Kvatch is a major settlement in the eastern highlands of the Gold Coast. The city is ruled by Count Carolus Aquilarios, although the count is locked in a power struggle with Primate Artorius and his Order of the Hour. Kvatch maintains loyalty to the Empire despite its collapse, and faces hostility from Anvil which claims dominion over the entirety of an independent Gold Coast. 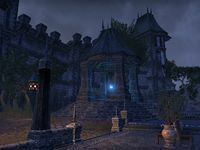 Kvatch Wayshrine can be found just outside the city gates, to the south.